A senate subcommittee hearing on the texting and driving law. Iowa legislators are considering a crackdown on smart phone use behind the steering wheel. A bill that would let police pull over vehicles if they suspect the driver is texting has cleared a senate subcommittee today. Iowa’s law enforcement community, cell phone providers and insurance companies are urging legislators to go farther, however, and make it illegal to use a hand-held device while driving. Susan Cameron, a lobbyist for the Iowa State Sheriffs and Deputies Association, said distracted driving is a top concern. Governor Branstad supports a “hands free” law. Amber Markham of the Iowa Department of Public Safety urged legislators to take that step. “We just feel that distracted driving is just far too big of an issue to pass the buck another year and not do something that’s going to make real change,” Markham said. About 70 percent of fatal accidents in the past three years were caused by a vehicle that drifted out of its lane and Markham told legislators those lane departures were likely caused by a distracted driver. Steve Gent of the Iowa DOT held up his smart phone and his car keys, to make the point that teens today have had a smart phone in their hands long before they ever handled a steering wheel. Iowa crash data indicates the number of accidents caused by a driver distracted by a cell phone or other electronic device has “nearly doubled” in the past five years. 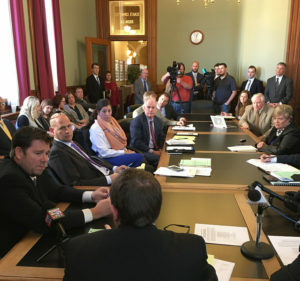 The lobbyist for Iowa State Sheriffs and Deputies Association said using a cell phone behind the wheel takes the driver’s eyes off the road and at least one hand off the wheel, plus the driver’s mind is focused on the phone, not on driving. After the subcommittee meeting this morning, three senators endorsed a bill that would let law enforcement ticket drivers for texting and driving. Today, texting while driving is a secondary offense for Iowa adults, meaning police may only issue tickets if the driver has violated some other traffic law, like speeding. The American Civil Liberties Union of Iowa is the only group registered in opposition to the bill. “Iowa already has a huge racial disparity in arrest rates and we don’t think doing anything to increase arrest rates in Iowa is a good thing,” Daniel Zeno, policy counsel for the ACLU of Iowa, said during today’s subcommittee meeting. The next stop for this debate about texting and driving is the Senate Transportation Committee.